Fun, well-paced adventure story that will keep young readers engaged. Koolura is a strong main character who knows her mind. She’s kind and inclusive. And the best part is that she has powers. The powers made her adventures that much more fun. Some of the scenes ended abruptly, and I found myself having to read a second time to make sure I hadn’t missed a transition, but well-paced action and tension were fine diversions that kept me moving forward in the story. I especially liked Koolura’s friendship with Leila, who suffers a hearing handicap. Their friendship was a fine example of how easily overlooked differences can and should be. Recommended for middle grade readers who like a little magic in their adventure stories. 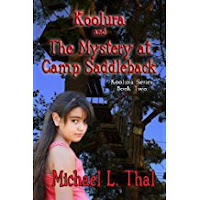 So glad you enjoyed Koolura and the Mystery at Camp Saddleback. Leila returns with Koolura in the third installment to the series, Koolura and the Mayans. Wonderful to hear there will be more. Middle grade readers love to go on multiple adventures with favorite characters!